The Learjet 45 (LJ45) aircraft is a mid-size business jet aircraft produced by the Learjet Division of Bombardier Aerospace. The Model 45 was the first all-new design since the original Learjet, and significantly altered the Learjet line. Through its four primary variants – the original Model 45, the Model 45XR, Model 40 and Model 40XR – it was the Learjet Division’s principal product from the 1990s until the introduction of the Model 75 variant in 2012. The Learjet 45XR is an upgraded version of the Model 45, introduced in June, 2004, offering substantially higher takeoff weights, faster cruise speeds and faster time-to-climb rates than the Model 45, chiefly through modifications to the engine. The XR allowed a gross weight 1,000 pounds greater than the original Model 45, greatly increasing payload and fuel/range options. The aircraft also has exceptionally short runway requirements for mid-size bizjets, capable of loaded flights from 4,000-foot runways. The 45XR’s performance and specifications increases are due to the upgrading of the engines to the TFE731-20BR configuration, flat-rated to 3,500 pounds thrust, even at 104 degrees Fahrenheit, well above the 88-degree mark for that power from the original Model 45’s TFE731-20 engines. The Model 45 cockpit is equipped with a four-screen Honeywell Primus 1000 EFIS avionics system, with TCAS and EGPWS. 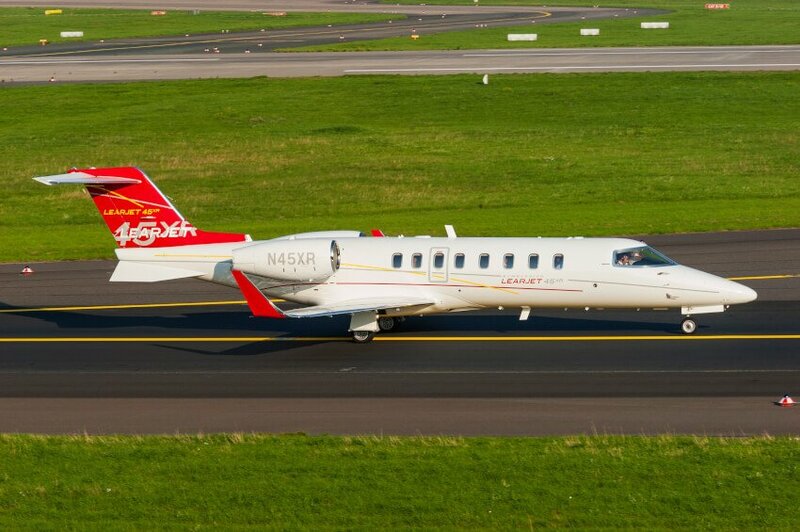 AeroClassifieds is the aviation marketing platform where you can search to buy Learjet 45 aircraft advertised for sale. By completing your search for Learjet 45 you can then compare and contact the selling agent or the owner directly via the contact form to request more information about the aircraft for sale.